Q: I have a few different sessions happening back-to-back. 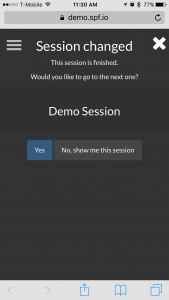 How do I redirect the audience in the mobile view to a different session? A: Once a session is finished, follow the instructions below to change to the next session. The audience in the mobile view will get a message letting them know to switch to the latest session. In the Interpret view of the session that just finished, click on the menu. Select the session to change to (aka the next session) and check the boxes for “change session for all associated views” and “change shortcut paths to point to this session”. Then click OK. The page will redirect to the next session.